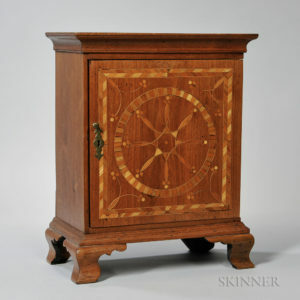 American treasures at Skinner | Skinner Inc. Folk art and fine art, scrimshaw and silver, rugs and relics, pottery and portraits, tables and trade signs: every category of Americana is represented in this auction of more than 700 lots, many from some of the country’s most discerning private collectors. Charles Ball Constitution Whalebone Cane and Scrimshaw Whale’s Tooth, c. 1841 (Lot 144, estimate $50,000-70,000). Ball, in whose family these pieces descended, served on the frigate in 1839-41. The cane’s inscription includes the words BAY OF CALLAO JULY 4 1841, a reference to a notable raucous whiskey-fueled celebration held aboard ship on the patriotic holiday. American School, early 19th century, Constitution and Guerriere (Lot 207, estimate $6,000-8,000) shows the aftermath of the legendary ship battle, rendered with both attention to detail and beguiling naivete. Thomas John Baines (British 1822-1875) The Pottiinger, Magellanes, & Nostra Senora Della Carmine Returning to Table Bay After a Gale (Lot 219, estimate $15,000-$25,000) painted in Cape Town, Africa, 1847. Pilot Boat No. 9 Painted on a Plate (Lot 213, estimate $5,000-7,000), signed “Jacobsen NY”. This oil-on-ceramic is a departure for the noted marine artist Antonio Jacobsen, most often represented by works on canvas such as his Portrait of the Isaac Webb (Lot 214, estimate $4,000-6,000). Additional marine-themed pieces include numerous seascapes, scrimshaw canes and carvings, and half-hull models. Some of the predicted top lots in the auction represent a single category of American folk art: weathervanes, many of rare forms and with good surfaces and color, and almost all from a Cornwall, Connecticut, collector’s home. 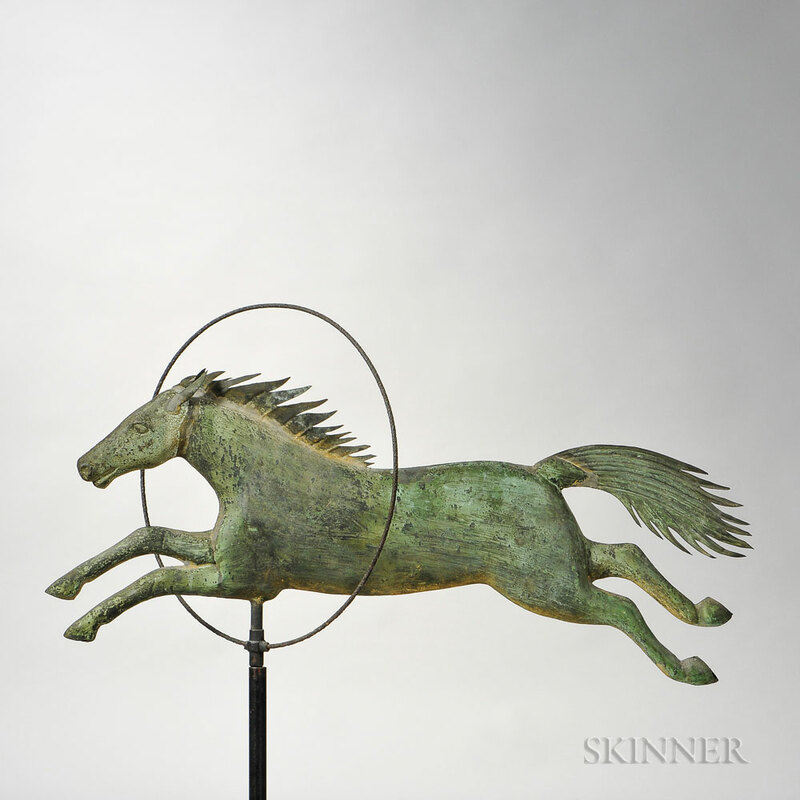 Prime examples are a Molded Copper and Cast Iron Horse Jumping Through Hoop Weathervane, attributed to A.L. Jewell and Co., Waltham, Massachusetts, c. 1852-67 (Lot 17, estimate $25,000-35,000), and a Merino Ewe Weathervane, possibly by A.J. Harris & Co. of Boston (Lot 72, $12,000-18,000). In addition to iconic roosters and horses, there are also a codfish, a setter, a leaping stag, and a running fox. Furniture is, as always, an important presence. From the Cornwall collector’s house comes an early 18th century New England Black-painted Oval Top Tea Table with an elaborate cut-out skirt (lot 50, estimate $4,000-6,000) Other tables large and small, chests of drawers, chairs, and cabinets, both formal and country, are all well represented by such pieces as a Carved Cherry Scroll-top Chest-on-chest, Connecticut River Valley, c. 1765 (Lot 55, estimate $8,000-12,000). Several of the furniture highlights come from a private mid-western collection, including 18th century chairs from Philadelphia, Boston, Connecticut, and Rhode Island, and a Diminutive Carved Cherry Chest of Drawers with delicately carved ogee feet, (Lot 288, estimate $6,000-8,000). One of the most desirable items of furniture is also one of the smallest: an Inlaid Walnut Spice Cabinet, Chester County, Pennsylvania, c. 1765-80 (Lot 500, estimate $15,000-25,000). This example is notable for its overall quality and fine proportions. The richly inlaid door opens to reveal eleven interior drawers of varying sizes. Portrait of David Mumford (1730-1807), New London, Connecticut, painted by Joseph Blackburn, d.1778 (Lot 251, estimate $30,000-50,000). According to family lore, David engaged in trade with the West Indies until becoming a privateer during the French and Indian War. In 1757 Mumford took a prize schooner but soon after was captured by the French and sent to Martinique as a prisoner. He escaped and returned home, and this portrait was painted shortly afterward. During the Revolutionary War, Mumford served on the Governor’s Council of Safety. Platte River, Colorado, Worthington Whittredge, 1820-1910 (Lot 59, estimate $20,000-40,000). A noted member of the Hudson River school, in 1865 Whittredge traveled across the Great Plains to the Rocky Mountains. The resulting spare, luminous landscapes of the vast silent spaces of the west were among his most sought-after paintings. This Whittredge picture highlights the Cornwall collector’s group American paintings, which also includes works by John Frederick Kensett, Jervis McEntee, and John Williamson. Horses in a Pasture, Stefan Hirsch, American, 1899-1964 (Lot 343, estimate $800-1,200). Hirsch painted a variety of subjects in a variety of styles and exhibited alongside some of the icons of American Modernism at the Downtown Gallery in the late 1920s and early 30s. Some of his most admired works are reserved, precise, and austere renderings of the natural world like this. This far-ranging sale includes multiple examples of early American silver, trade signs, game boards, a well-edited collection cast iron doorstops, 19th century export porcelains, early to mid-20th century Mennonite quilts, over two dozen Currier & Ives lithographs… indeed, something for every lover of fine Americana. Widely regarded as one of the most trusted names in the business, Skinner appraisers have appeared on the PBS-TV series, Antiques Roadshow, since the show’s inception. Skinner has galleries in Boston and Marlborough, Massachusetts, as well as in New York City and Miami, Florida, with bidders participating in person, by phone, and online. Join auctions live with SkinnerLive! and Bidsquare. For more information and to read our blog, visit the website at www.skinnerinc.com, find us on Facebook, or follow us on Twitter and Instagram. This entry was posted in News and tagged American furniture, Americana, americana auction, decorative arts, folk art, scrimshaw, weathervane by Kerry Shrives. Bookmark the permalink.